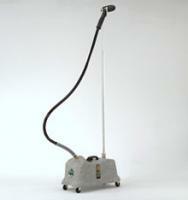 The heavy duty Model J-4000D Commercial steamer is equipped with 1500 watts of steaming power. The J-4000D is equipped with a 7 1/2 foot hose with a plastic steam head and handle and a 1 gallon self-contained water tank with preheat and steam settings. It contains a sight gauge on the side of the steamer to view water level and sediment build-up at a glance. The J-4000D heats up within 15 minutes to preheat temperature and produces steam within 2 minutes once at the preheat temperature.